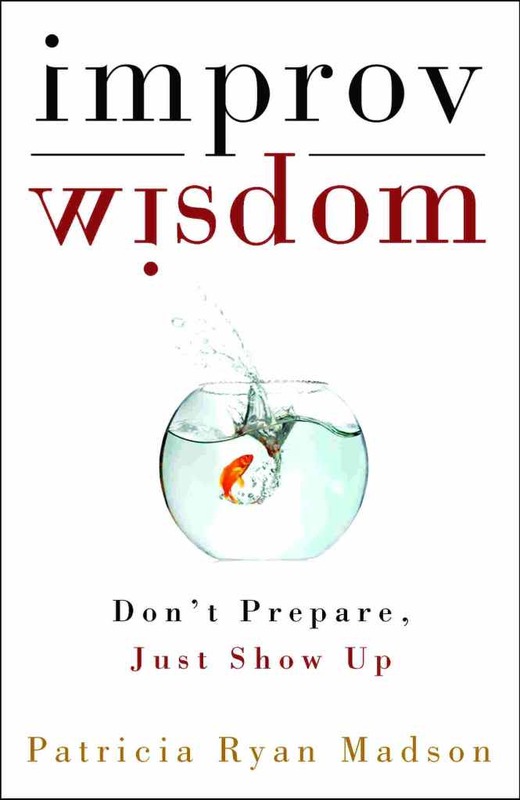 improv wisdom: Don’t Prepare, Just Show Up by Patricia Ryan Madson is our final Book Club book for 2011 which we will be discussing on 8-Nov at noon at the Plymouth Congregational Church. The Meyvn Group does an amazing job of facilitating discussion that makes the book much more meaningful. I’m the consummate planner. While I only have one “to-do list” (unlike some people), I’m very religious about it. It helps me make sure things get done. I overly prepare for speaking engagements and meetings with clients. That’s what you’re supposed to do, right? Be Prepared? I was a bit confused by this book. I think the main thrust was to lighten up a bit when it comes to your personal and professional lives, but not to let your whole world fall out of balance. Live an unscripted life like an improve actor does when they get on stage. Say yes – to everything. Sometimes, our first impulse is to say no, without having any reason at all. This may keep us from having amazing experiences. Great for personal: Your child wants to play hide and seek; Bad for professional: I’d be doing a LOT of work for free. Don’t prepare – Don’t substitute list making/planning for getting things done. Sometimes while preparing, we’re not living in the moment and being part of the present. Great for personal: Hoping in the car and driving around for a new restaurant to try; Bad for professional: I’d give an awful hour-long presentation if I didn’t prepare for it. But I also can’t prepare for all of the questions, so I have to be prepared to live in those moments as best I can and improvise answers. Just show up – Nothing will happen to you in a vacuum. You need to be in the place where things are happening. Great for personal: Create a ritual that gets you prepared to do something you don’t particularly want to do, such as exercising. Great for professional: Some small business owners are introverts and are afraid to network in social settings; perhaps they allow themselves to arrive with a buddy the first few times until they’re over their fear. Start anywhere – there’s never a “right” place to begin. Great for personal: Been putting off cleaning your home because it is a disaster area? Set a timer for 20 minutes and play your favorite upbeat song and see what you can get accomplished by just beginning. Great for professional: Starting a new business? Bid on a huge project and win? Start anywhere and begin chiseling away. Large tasks can be overwhelming, so just start anywhere to get the ball rolling. Be average – Some people choose not to do something because they can’t be perfect at it. Others aren’t “finished” with a task until it is perfect (in their opinion). This stalls progress. Great for personal: Life will pass you by if you waste time ironing all of your cloth napkins – just use paper or live with the wrinkles! So-so for professional: I strive to give my clients the best. Shouldn’t we all? Is it alright to “Be nothing special”? Pay attention – how much do you notice and remember? It’s not about you. Great for personal: I was in a wedding this weekend and knew only the bride and groom. At the rehearsal, I made it a point to meet as many people as possible AND remember their names. For those of you who know me, you know that this is quite difficult. Julie and Todd, Mark and Chris, Jana, Mike and Kim, Tom, Michelle, Ezra and Caleb, Tricia and Kristina. Knowing everyone made the reception more enjoyable. Great for business: The best advice I received early in my consulting/coaching career was to listen. Hear the words people are saying and listen for the things they aren’t. Take notes and repeat back to the person what they’re saying for clarification. Face the facts – use what is given, build upon it, abide with things as they are. Great for personal: accept people for who they are, if your day isn’t going well, make lemonade out of lemons. Great for professional: laptop doesn’t want to boot up before a presentation. Borrow another laptop and run the presentation from SlideShare where you uploaded it before you arrived. Stay on course – keep in mind what you are aiming for, “What is my purpose now?” Accomplish more things more quickly by staying focused on the task at hand. Great for personal: fix something that’s broken, help a neighbor, find a creative way to repurpose leftovers. Great for professional: improvise to meet a deadline, assuage a finicky client, or solve a problem with limited resources. Wake up to the gifts – the glass is always half full, there is always something in any given situation that you can work with; there is always someone or something there to help. Wake up to this reality and leverage it. Great for personal: recognize and give thanks to the things around you. Appreciate what you’ve been given in life. Great for professional: appreciate that you have a job – even if it’s one that you don’t like. Make mistakes, please – making mistakes is how we function; they are not to be avoided. Do something risky or challenging, something out of your comfort zone. Great for personal: Take all four of your children under the age of seven grocery shopping with you. You may be surprised how well they behave. Great for professional: Throw yourself head first into the world of public speaking. Start small to get some practice. Act now – begin before there is a plan. What we do moves us forward and gives us more information about how to proceed. Great for personal: not sure what color to paint your walls? Try several on the walls to see which you like best. Bad for professional: don’t make a cold call without first preparing what you will say, don’t attend a networking event because you know you should. Have your introduction prepared to get the most out of your time spent at the event. Take care of eachother – make your partner look good, do what is necessary to advance your mutual efforts. Great for personal: Maintain a joint front while co-parenting children. Great for professional: As an independent professional, I still “take care” of my fellow independent professionals by bringing them in on projects where I lack the required skills which makes us both look good. This act gives the Free Agent community a good reputation and helps us all. Enjoy the ride – have fun and enjoy the ride. Great for both personal and professional. How can you incorporate these maxims into your personal and professional lives? Thank you for taking the time to review my book in such detail. I appreciate the ways that you illustrate its applicability to personal and professional life. You are a writer’s dream: someone who really reads the book and understands the author’s message. May all of your improvisations turn out well!